This week has been a week of patience for me. 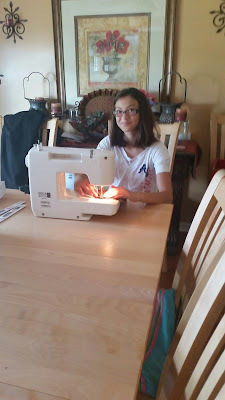 I have been teaching my 12 year old daughter to sew. Although one of my most favorite things to do in life is sew, teaching someone to sew is not easy. I remember as a young girl, begging my mom, "PLEASE! JUST LET ME USE YOUR MACHINE." All the memories of what my mom must have felt as she dreaded pulling that machine out, became my realization this week. I thought she just didn't want to sew. I didn't know she was trying to avoid teaching me to sew! Of course, it's not that I don't want my children to learn how to sew. I want my children to have the special memories I did of creating something from scratch. I want them to know the satisfaction of finishing a project and knowing I made it. But, someone has to take time and patience to get them there. And I'm the one that has been chosen for the job. Did you get that moms? He, the God of the infinite universe, has plucked me out of infinite eternity to have patience with this 12 year old girl. Right here. Right now. He knew, once I found my place in maturity (haha), that I would have exactly what I needed to take care of THIS child. He showed me that, just like her, I need to grow into what God has called me to do. I look back on my life and realize that I'm just like that child that needs to learn to sew. No, I don't need to learn to sew, but I need God's grace and mercy (for me these are other words for patience) to "perfect" that which He has started in me. I'm still really busy in trying to figure it all out, but like the loving Father that He is, He gently leads me from where I'm at to where I need to be. No, I don't always like the tough stuff that polishes me and softens me, because those things tend to be hard and even painful, but He waits patiently for me to come to a place where I learn to rely fully on Him. Today, we are learning to move beyond threading the machine and sewing straight lines. I know it might be a long day, but I am ready! She said to me last night that she can't hardly stand to go to bed, because sewing is just so addictive! I agree, Baby, I agree. A girl after my own heart. Now to try and get anything else done besides creating on our machines. This momma's heart is happy and right where she's suppose to be. This is so REAL to me!! When I was 12, (really), I was taking Home Ec in jr. high and sewing was one semester. My mother was an expert seamstress. She could look at something someone was wearing and, without a pattern, figure it all out and make it, but with her own special touches. Well, it was my turn and she would "help" me with the jr. high skirt I was trying to make. She made me rip out more seams than it had to rip! But she wanted me to learn the right way to sew. I did, but the patience on her part must have run mighty deep! This is great to be reminded for my Mama has been gone from this earth for almost 2 1/2 years now, but the sewing memories are dear. I would even ask her "how tos" as I needed help with something while she was aging in her 90s in a nursing homes. She loved to help me even then.